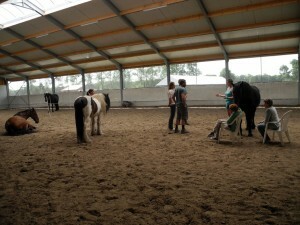 Consultancy, training and coaching on the effect of authentic leadership and dynamic balance on the work floor, inspired by the high-performance structure within natural herds of horses. A herd of horses is so much more than just a collection of horses. Within the herd there’s a harmonious structure of individuals that gets formed in an authentic way, each individual performing autonomously within the dynamics of the herd. This phenomenon has inspired Equoia to have a solution focused and innovative look at the set-up, the management and the functioning of organisations. Working towards Dynamic Balance is a core element in creating agile organisations. For our team coachings we work toghether with the organisation True Colours (www.truecolours.be : new website under construction), this guarantees a professional implementation of what is brought about in the sessions with the horses. We do team coaching and inidvidual coaching, for managers and for co-workers. Every programme is made-to-measure: more info on demand. The hierarchy within a natural herd of horses shows us the core elements of authentic leadership, hence creating a lot of space for cooperation, creativity and own initiative. Horses often seem to get in conflict, but actually they are testing you in every moment. They don’t do this to denigrate you, they do this to check what qualities you dispose of in this moment to be able to take care for joint safety. So, they are continuously testing to gather information. But that’s obvious, isn’t it? That’s just the way things go. Well, I’ve clearly mentioned it!… When starting from self-evidence is, you see your perspective as the (only possible) reality. A mindset of amazement brings about widening of one’s frame of mind, tuning, empathy and space for creativity. We can learn from horses how to better guard the balance between work life and private life. Horses teach us how to take care of our own energy, how to become aware of the different parts you have to play and hence to do what is needed (and to let go of what is not). Amongst people there’s an (often unconscious) colouring between observation and action due to the own frame of reference: saying what you see can be different from saying what you think you see… Giving words to what you notice in interaction and checking whether what you notice is what the other means, creates space and lays the foundations for constructive open interaction. A natural herd of horses is a a paragon of efficient cooperation. All noses point at the same direction. How do you establish that in organisations, especially when people are sometimes working remotely? Clarity about vision, mission, values and standards are core elements, together with making sound agreements and living up to them.